Drag the painting to the top and pull the toothed wheel around the room to the door. Slide the flower vase to the left then press the lever to open the door. Slide some rocks from left to right and press each butterfly around the room. Press the box on the door, get the green stone in the bucket, press the water to pick up the white stone, slide the statue right and take the pink stones. Press the tree to get the pink stone, press the plant on the top left to get the white stone, press the top of the door to get the green stone. Pull each stone the same color without cut the line. 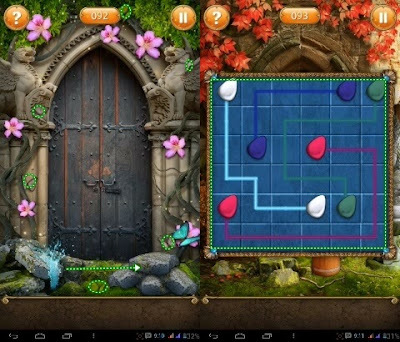 Press the puzzle circle on the door and press each piece of the puzzle to arrange it correctly. Tap the crystal stone on the right-hand floor until it breaks and drops downwards and place the crystal stone into the chain on the top right of the door and pull the chain down to open the door.